Sonic Gun are hold a mammoth weekend live music event at The Castle & Falcon – running from Friday 17th to Sunday 19th August. And although we’re only giving you a few hours notice… it’s been one of ‘those’ weeks, we still think it’s something worth SHOUTING ABOUT. Doors open at 6:30pm on Friday, with bands playing from 3:30pm on Saturday and 3pm on Sunday. Tickets are a very kind £15 for the whole kit and caboodle, with individual day tickets also available for £8. Minimum age of entry is 14 years, with anyone under 16 needing a card carrying adult to pop along with them. For direct information check out the Sonic Gun Weekender Facebook Event Page here, or go to the Castle & Falcon website here. So, who’s on..? As if getting to spend the weekend in a pub watching live music for £15 wasn’t a compelling enough reason to drag yourself off the sofa. The whole line up is featured on the poster above and looks like a bit of a plate spinning/band booking miracle, especially considering you’ve got Project Soundlounge on one side of this event and the August Bank Holiday weekend on the other. But hyperbole aside, some of the cream from Birmingham’s live circuit crop are playing at the Sonic Gun Weekender – with each day top, tailed, and stuffed like a pimento olive with bands well worth the daily door charge alone. On Friday, the somewhat now past ‘rising balloon’ Riscas are headlining a bill, with local pop-rockers The Assist and Spilt Milk Society confidently chasing the top spot. Also appearing on this local yokel Friday night line up are Social State and Echo Beach – the one’s from Shrewsbury, not Liverpool or Quebec. There will also be a DJ set from one side of the main B Town see-saw, Swim Deep. Saturday sees those cool kids Ivory Wave (…slow editorial hand clap) bring some multifaceted early 90’s indie to the top of the bill. A real Birmingham success story in the making, in my mind Ivory Wave just need to be locked in a room with Andrew Weatherall and given a good old shake. But for now you can watch them share their space with Sugarthief, The Cosmics, Violet, and a smattering of others including Cave Girl – who we are a little keen to see live, loud, and in the flesh. And completing my lazy metaphor, Peace will be delivering a Saturday night DJ set. Then rounding off a pretty full weekend by any normal human standards, that rockabilly rockstar Harry Jordan will be headlining the Sunday setlists. Joining Jordan in a somewhat eclectic goodbye will be a bite of rhythm and blues from The Surrenders and The Good Water, with the rougher raucous coming from Bad Girlfriend, Kick the Clown (best band name ever) and one of our favourites at Birmingham Review, P.E.T. Paper Buoys will be DJing for the final day, sans wordplay. There will also be beer from Dig Brew, who (after some extensive research) serve the city’s best rocket fuel in a glass by far, and food from The House of Hen – who we haven’t researched but we’re educated guessing serve chicken. Or houses. But check out the banner above or visit the Sonic Gun Weekender Facebook Event Page for more details. Or just buy a weekend ticket and throw yourself in eyes wide shut – at £15 for a three day line up you can’t go wrong really. 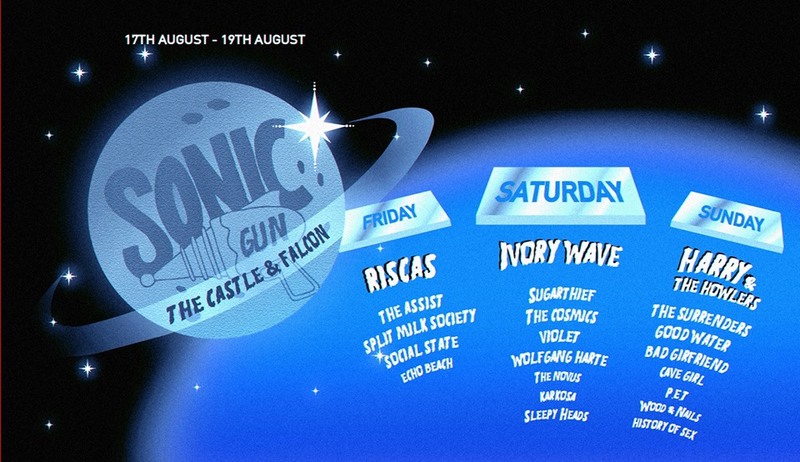 The Sonic Gun Weekender comes to The Castle & Falcon – running from Friday 17th to Sunday 19th August. For direct event info and links to online ticket sales, click here.